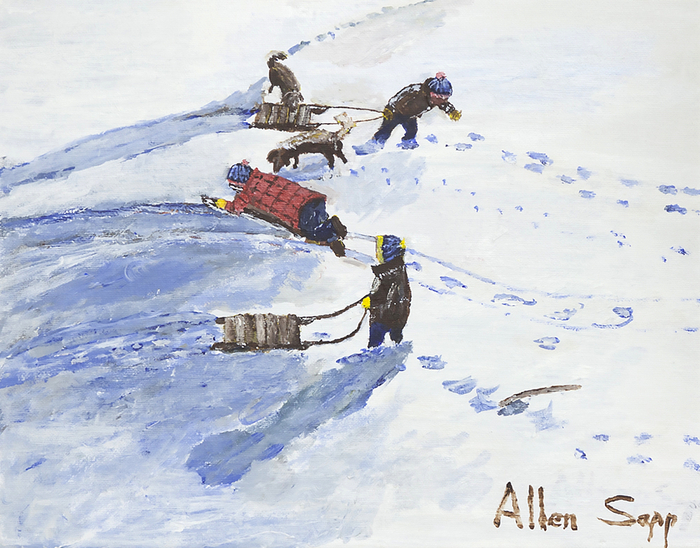 Famed Saskatchewan painter Allen Sapp died in his sleep this morning, at age 87. Sapp was born in 1929 on the Red Pheasant Reserve in northern Saskatchewan, a descendant of the great plains Cree Chief Poundmaker. As a child, Sapp was often bed-ridden with illness, and he began drawing and painting with the encouragement of his grandmother, Maggie Soonias. Sapp had been the subject of documentaries including Allen Sapp, By Instict a Painter, the National Film Board of Canada's Colours of Pride, the CBC's On the Road Again, as well as boosk such as A Cree Life by John Warner and Two Spirits Soar by W.P. Kinsella. In 1975, he was elected to the Royal Canadian Academy of Arts, and he received the Saskatchewan Award of Merit (1985), the Order of Canada (1987), an honourary doctorate from the University of Regina (1998), a Saskatchewan Arts Board Lifetime Achievement Award (1996) and a National Aboriginal Lifetime Achievement Award (1999). In 1989, the Allen Sapp Gallery, Canada's only public art gallery named for a living artist, was opened in North Battleford. The most extensive permanent collection of Sapp's paintings can be found there, though his work is represented in many other public and private collections across the country. In 1994, the MacKenzie Art Gallery (Regina) launched a touring retrospective of Sapp's work. The exhibition was called “Kiskayetum” – Sapp's Cree name meaning “he perceives it.” In 2003, Allen won a Governor General's Literary Arts Award for the children's book The Song Within My Heart, which Sapp had illustrated. Allen Sapp died December 29th, 2015, in North Battleford, Saskatchewan.